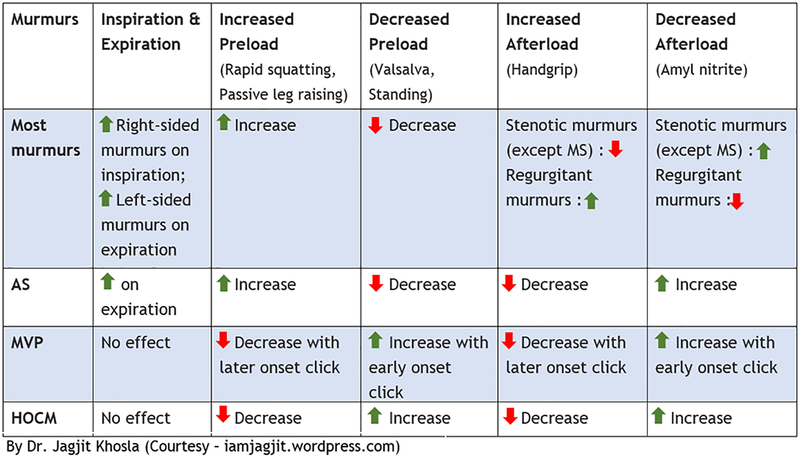 Mechanism : Handgrip increase TPR which increase afterload. Increase afterload makes it difficult for blood to flow forward from heart into aorta. Therefore, decreased forward flow will lead to decrease in intensity of forward flow murmurs e.g. AS, while it will increase the intensity of regurgitant or backward flow murmurs e.g. MR. In case of HOCM and MVP, its worth remembering that anything that increase the blood inside Left ventricle will decrease the HOCM and MVP murmurs. In MVP, the cause of regurgitation is floppy chordae tendinae holding the mitral valve leaflets. When heart is filled with extra blood, the tendinae become tense leading to less regurgitation. So, anything that will increase the blood inside left ventricle will decrease the MVP murmur. Curious case of Amyl nitrite : Amyl nitrite is a vasodilator similar to Nitroglycerin but where Nitroglycerin has major effect on veins (i.e. Venodilator), Amy nitrite has major effect on arteries/arterioles (i.e. Arteriodilator). So, when we give Nitroglycerin to patient, prominent effect is decrease in preload (dependent on veins). But, when Amyl nitrite is given, the major effect is decrease in afterload (dependent on arteries). That is the reason to classify Amyl nitrite in separate category from valsalva or standing (which only decrease preload). Now, coming on to the effect of Amyl nitrite inhalation, it dilates the large arteries -> decrease total peripheral resistance (TPR) -> decreased afterload -> increased forward flow of blood in left side of heart. Effect on AS murmur : As the blood flow through aortic valve increases, the murmur increases in intensity. Effect on HOCM and MVP murmur : As the blood flowing out of heart increases, there is lesser amount of blood inside the heart at any time. As already explained in the previous maneuver, lesser blood inside left ventricle will increase the murmurs of HOCM and MVP due to the reasons already stated. Exception : Mitral stenosis murmur is not affected by the maneuvers affecting afterload e.g. Hand grip and amyl nitrite inhalation. This is because the maneuvers affecting afterload doesnot affect ventricular filling during diastole. Wow! This is so helpful! Thank you so much, Jags! Omg its just awesome…………..become ur fan now……….u cleared all my pending doubts…. It helps a lot… Thanku for such a precise and accurate explanation of the topic….